How many times have you thought about “I need to make money” today? The traditional ways to work on this topic and many people will advice you is to get a better job, take a moment to think about that. Some people will get it easily, they have a good job and they want to improve their lifestyle and they already have a network that supports them in a good way so they will find easily a new job. In most cases this doesn’t happen, but I don’t want you to get frustrated and close my website and go, I like to talk from a realistic point and talk to you on the reality of things. I’m going to talk here about scenario 2, I know a person who is also looking for a better job to make a better living, she has a good job but she got to the point that she wants to get a better job as she is no longer happy on her job. There most be a better way to get a job where you can make a better living! Everyone of us should be so happy to live at this present moment, where technology opens a big door for all kinds of opportunities in front of us. Today, I want to tell you how you can start working on something on your own to start making money from home on something you like to do. More and more people are finding the way to work from home and many of them are hitting the nail. What the people who are making money do different from the rest to make their business a success? If you have a friend who is running his or her online business, it’s time to give him or her a call and invite him or her a coffee or a glass of wine. Most of the people who are running a successful online business would love to share with you their tips and secrets so you can also can start making money. If you don’t know anyone who is already making money from the internet, you’re here and I will tell you what to do so you can start making money from home with an online business. Grab a notebook and keep it in a place where you can find it easily. You’ll be working on it writing your ideas and working on plans and strategies, don’t worry, the more you write and the more you work on your plan the easier it will be. Don’t leave any idea on your mind, in 5 minutes you might not remember that idea anymore. 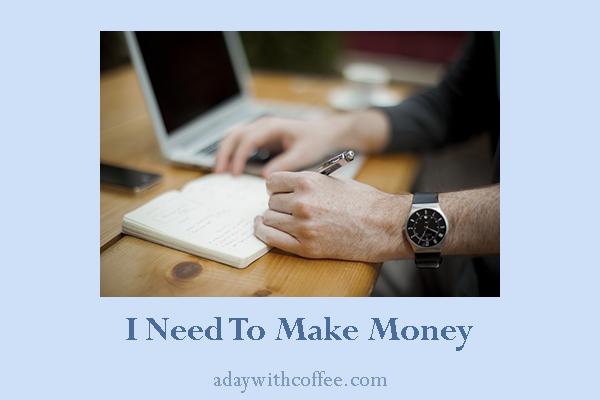 Blogging to make money is a good idea to work on it, but you need to know what kind of blog will you be working on in order to make money from it. The first thing you need to do, write down everything you like to do on a paper (yes, on your notebook), if you think something you like to do it’s not too popular, write it down anyways you might get surprised, it might be a good idea to work on it. If you don’t find more that 10 things about what your good at or love to do it, ask your family members about what they find your good at or love to work on, you can also call your friends and ask the same questions. You might find you’re good at more thing that you thought to. Once you get that list, take your time to read it again as many times as you need to, and highlight the ideas you find easier to work on. I think by this point you have found what you love to do, but this is just a start. 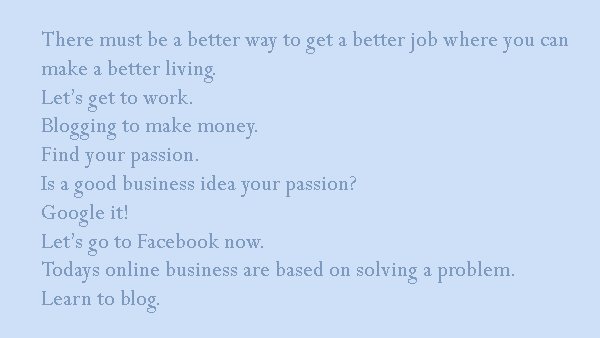 Many people will advice you to start a blog on what you love to do, your passion, and they are right, but you still need to work a little bit more to reach success on your passion. Is a good business idea your passion?. What if I tell you that I love to cook quesadillas for breakfast? Well, you might find that what I love to do might be something a few people will be interested to do! Why to start a business on something just a few people would be interested to do?, I might work hard on it and at the end I will finish just making just a few dollars from it and thinking that internet business making is just for very smart and talented people. The truth is, my business idea was from the beginning destined to be a huge failure! why? because today, before you start any business you need to be sure if your business idea will solve any problems. I live in Canada, where winters are long and cold, do you think there will be anyone interested to buy a “new” hat or scarf for next winter? I think I can find one or maybe two people interested to buy from me! How can you find this could be a good business idea? And you will find there how many people will be interested on buying a new hat and a new scarf for this winter, and some people will be interested on buying more than one! Now you know this could be a good business idea. You need to know more about the same topic. Let’s go to Facebook now. You will need to search for keywords for “knitting winter hat” or ” knitting scarfs”, you will see Facebook will tell you there’s Fan’s Pages on Facebook where people talk about this topic. You can go on two or three pages on Facebook and check on how many people follow that page, the more people follow a page, that will let you know how many people are interested in your business idea or on your passion. Let’s keep talking about the same topic just as an example, Knitting. 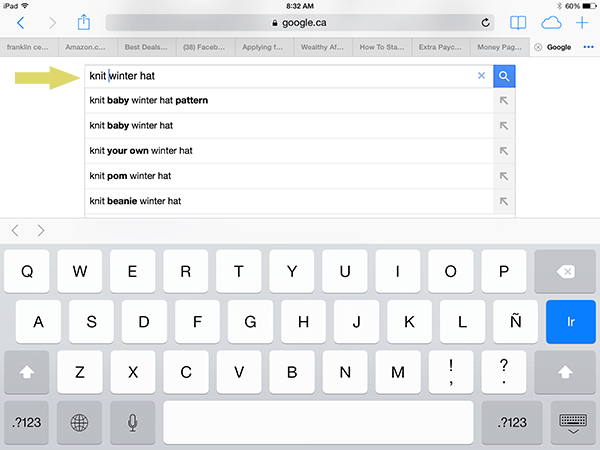 Go back to google and type: knitting a winter hat. You might find Raverly.com and Craftsy.com on your search. You need to work a little bit more and find how many people have already signed to these website, millions! from every part of the world, there are millions of people interested on buying a winter hat or knitting a winter scarf for next winter. Now it looks like my business idea is not too bad, if there’s a group of people looking for something you love to do, you can think about this idea like a business idea. People everyday looks to solve a problem, any kind of problem, like: how to paint a house and save some money, how to cook dinner in 30 minutes, how to train a dog, how to play with a cat, how to teach your kid to read at home, etc. Todays online business are based on how to solve a problem. The more you know about your business idea and if there’s anyone looking for it on the internet you will have more chances of success with your business idea. The more people who are already looking to solve a “problem” on your talents, it’s better, the more people who already have a problem to solve, there’s your business opportunity. One thing to have in mind, find a business opportunity that last in time, a business based on a problem that will be solved in a short period of time, won’t last as a business, these kind of business can make lots of money but it will require you work really fast. A better business idea is to find a wayto solve a problem that last in time. You will be making money year after year! You haven’t start yet your blog, but you have a better idea on how to work on your idea to build an online business with strong bases. 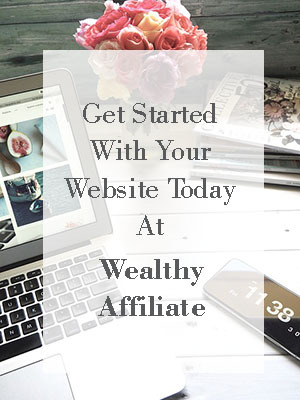 To find more about if someone is looking for your business idea, Wealthy Affiliate has a keyword tool that will help you to work with it as you work on your online business. 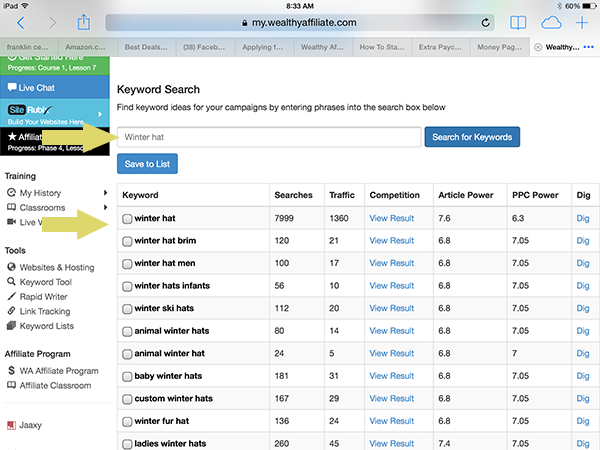 Not bad, there’s almost 8K searches monthly for “winter hat”, and there’s more information for more keywords related to mine that will help me to work on my business. Wealthy Affiliate has a keyword tool, you can learn how to work with it to find the right business idea for you, and you will be working with this tool to write content on your blog, and to work on the right product/service to make money online. 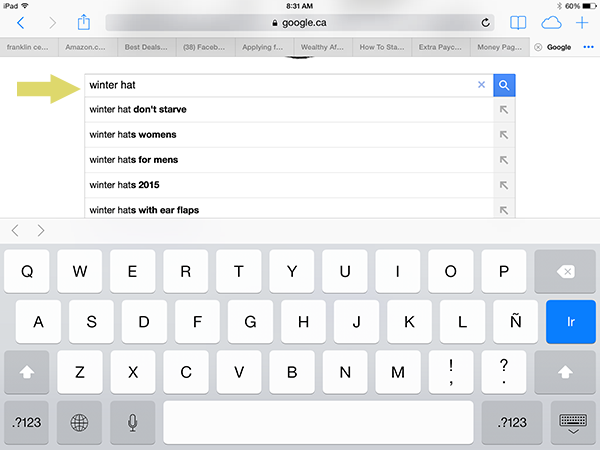 I did same search for a keyword, but this time I typed “knit winter hat. You can see here, there’s 80 searches monthly for my keyword, but you can see there’s more keywords related to mine and this will help me to work on my business. If you don’t know anything about blogging but I got you interested on starting one to start making money working from home, I will suggest you can start a free blog on Blogger.com and it doesn’t matter what the blog’s topic will be, I only want you to start it, and get familiar with it, upload pictures on it, write some content, add some widgets, as soon as you learn how to work on it, you can delete this blog, you won’t need it anymore but you will get the knowledge of how a blog works, and you will be ready to start a blog with more chances of success. If you know how a blog works by now, and you got interested on learning more about how to run a website to make money from it, I will suggest to you to sign up to Wealthy Affiliate and take the 10 lesson free course to learn more about how to open a website with WordPress, you can open up to two free websites at Wealthy Affiliate. Learning how to run your own business from home and make money from it, might take some time and in some cases will take one or two websites, but the more you learn before you open the website that will be making that full income you dream on, you will need to work on it. You’re so right, many people want a change from their ‘normal’ 9-5 job. Working from home, or anywhere else in in the world, is a great idea. There is no cap on the earnings from a website/s, so that is a much better future to be aiming for, than staying at a mundane job. Your suggestions are welcome, and should be attempted by more people. I also recommend Wealthy Affiliate, their Education is outstanding. It’s nice to meet you here and it’s nice to have a WA member reading and commenting on my site, I thank you for sharing with my readers your thoughts about Wealthy Affiliate, a place to be if you want to work the smart way building up an online business. What you say about learning the basic of a successful business that nobody told that, it’s so true. I went to school to learn hospitality management and all my teacher told me to “produce” something to sell, I think things are changing and today there’s people sharing their knowledge more openly, once again we are so lucky to be working on our business when people are willing to share more knowledge with more people, a win-win. Hi Aljandra and thankyou for your site. It was a beautifully friendly read. I love the way you write, its as if we are in the same room chatting. You shared some very valuable material especially about how to decide on what to write about and how to go about it. What you are saying is we need to find a problem and set about to solve it, or in other words I need to find a niche that I am passionate about and build a business around it. 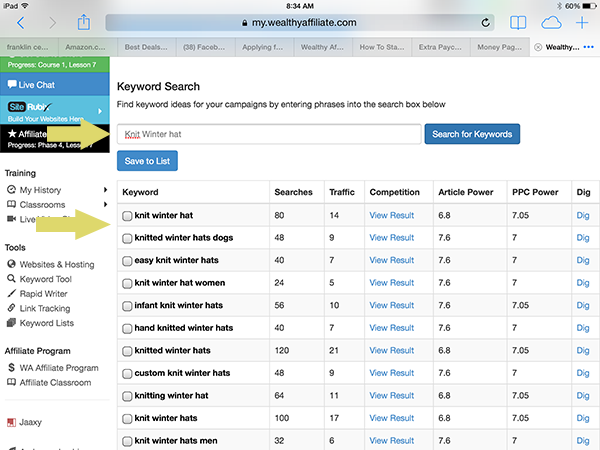 I also liked how you demonstrated how to do the research for keywords to use. I’m glad to hear you enjoyed reading my article as we were in the same room chatting, this is my porpoise, to share with you all I have learned while building up my online business. If you have any questions later while you work on your own online business let me know, I will be glad to give you a hand.